The Toyota RAV4 is back for 2019 with a fresh new look, new engine options and a long list of updates. Toyota has redesigned the crossover SUV from the inside to the out and the results are incredible. Every detail of the 2019 Toyota RAV4 is impressive, from the embossed seating inserts on the Adventure trim to the chrome exterior accents on the Limited model. 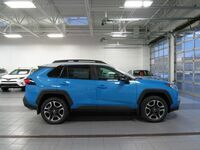 If you’re looking for a sophisticated crossover SUV that is fun to drive and has plenty of style, then the 2019 Toyota RAV4 is a must-see. And if you’re looking to equip with your RAV4 with all the latest premium features, then we recommend the XLE or the XLE Premium. Here’s what sets the two apart. See the all-new 2019 RAV4 at Le Mieux Toyota today! All 2019 Toyota RAV4 models come equipped with a new 203-hp, 2.5-liter four-cylinder engine paired with an eight-speed automatic transmission. Front-wheel drive is standard, but all 2019 Toyota RAV4 models are available with all-wheel drive. 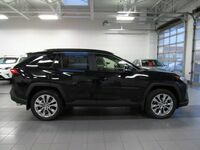 In addition to this option, the XLE model is standard with a 7-inch touchscreen, Apple CarPlay, Bluetooth, a six-speaker sound system, a sunroof, blind-spot monitoring, dual-zone automatic climate control and five USB ports. That said, the most significant difference between the 2019 Toyota RAV4 XLE and XLE Premium are the features available. The XLE Premium carries over all the features from the XLE, but adds a power liftgate, a leather-wrapped steering wheel, push-button start, keyless entry, simulated leather upholstery and a power-adjustable driver’s seat. The model also receives a slightly raised suspension, compared to the XLE model. We invite you to compare the two trims for yourself with a test drive at Le Mieux Toyota. Our team is here to answer your questions and help your shopping experience easy and hassle-free. Stop by and see us today!